Samsung Galaxy A20 has a younger sibling, Galaxy A20e. Part of the Galaxy A series smartphones, Galaxy A20e carries the design and aesthetics of Galaxy A20 but comes with a smaller 5.84-inch screen. In comparison, the Galaxy A20 comes with a 6.4-inch display. The screen size of the Samsung Galaxy A20e is similar to the Samsung Galaxy S10e. The phone was unveiled recently in Poland, Europe. As far as specifications are concerned, the Galaxy A20e comes with the octa-core Exynos 7884 SoC. It features a 5.8-inch HD+ (720x1560 pixels) TFT Infinity-V Display panel. This is notably smaller than the 6.4-inch Super AMOLED panel on the Galaxy A20. The phone has a 3GB of RAM and 32GB of expandable storage which can be expanded up to 512GB via microSD card. Samsung Galaxy A20e includes two cameras on the back and single sensor on the front. On the back, the phone includes a primary 13MP camera with f/1.9 aperture and a secondary 5MP ultra-wide angle camera. The selfie camera is an 8-MP shooter. Unlike the recently launched Samsung A-series phones, the Galaxy A20e comes with a rear-mounted fingerprint sensor. The phone runs on a 3,000mAh battery that supports 15W fast charging technology. The Galaxy A20e comes in two colours - white and black. 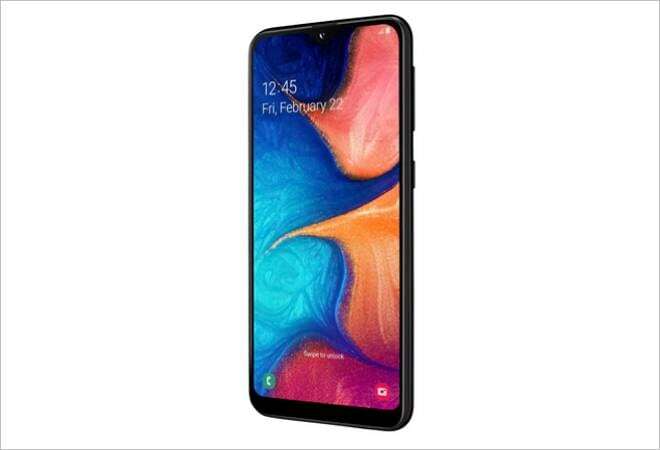 The Indian price of the Galaxy A20e has not been announced yet but going by the price of Galaxy A20, which is Rs 12,490, the Galaxy A20e could be a sub-10,000 smartphone. Earlier, Samsung announced Galaxy A80, with a sliding and rotating camera that functions as both front facing camera and a rear camera. Samsung Galaxy A80 comes with 8GB of RAM and 128GB of onboard storage which cannot be expanded using a microSD. The phone runs on Android 9 Pie with Samsung's One UI on top. Samsung had also recently launched the Galaxy A10, A30, and Galaxy A50 in India.